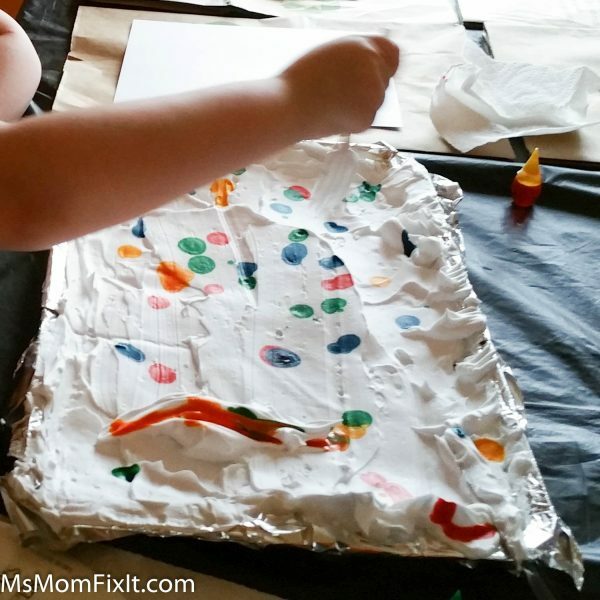 DIY Marbleized Paper can be a simple rainy day activity for both you and your children. While you can create one of a kind paper, you will certainly be laughing throughout this project. With any project that involves food coloring, I would strongly recommend covering your work surface with old newspaper or plastic tablecloth. Plus, you will want to make sure you and your little one wear a smock or some old clothes (in case of staining). Spread a thin layer of shaving cream across your cookie sheet. Add a few random drops of food coloring on top of the shaving cream. Stir with toothpicks or another utensil. 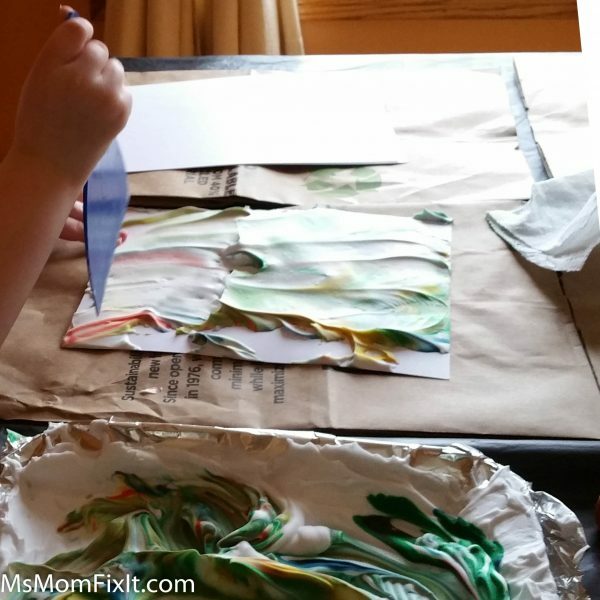 During this craft, we used a plastic fork hoping to get some cool swirl effects. Be careful that your child does not over mix the colors. Too much stirring will tend to make a solid color. With this project, we are hoping for a marbled effect. The perfect mix will have some light areas of color, some dark areas of color, and some overlapping over colors. I also recommend that you limit your colors to just 2 choices. Remember your color wheel from grade school? Let’s say you start with Blue and Red. Your result will be blue, red, and purple areas. However, if you add yellow, the yellow will tend to bring out orange and green. While this may sound pretty, if you keep stirring, you will likely end up with a brown mess. But- this is actually part of the fun! Let your child experiment with the colors! Since this is a transfer process, don’t be afraid to use lots of dye. The darker dye will produce a more vivid transfer. 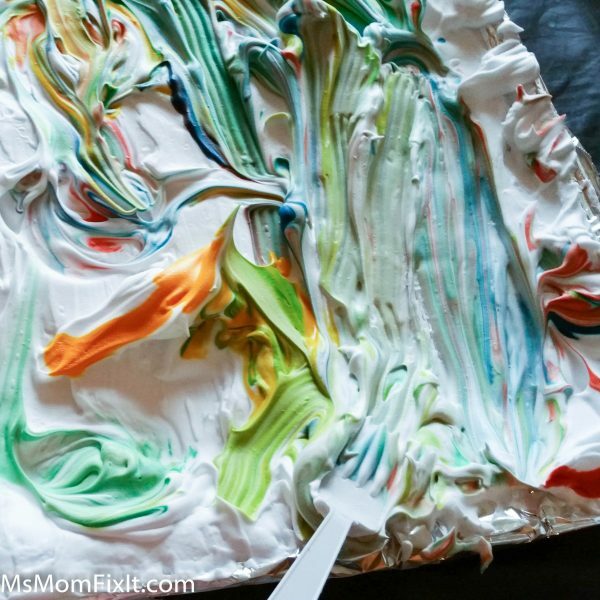 Once you have your colors lightly stirred, simply lay your paper down on top of the shaving cream making sure that the entire sheet of paper lays in the shaving cream mixture. I recommend leaving the paper there 5-10 seconds. Too long will like make the paper soggy. Not enough time could limit the amount of dye transferred to the paper. Remove your paper from the shaving cream and place in an open area of your workspace. Use a flat-edge to scrap the excess shaving cream from the paper. You could use a cardboard box lid, spatula, or squeegee. Once your shaving cream is removed, simply let your artwork dry. We let ours dry overnight although that is likely longer than needed. 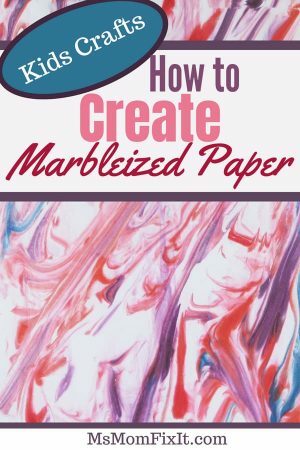 Once your paper is dried, you can use this DIY marbleized paper however you see fit. Use it as a beautiful stationery or simply frame your child’s artwork for inexpensive fun that will leave you with a fond keepsake.